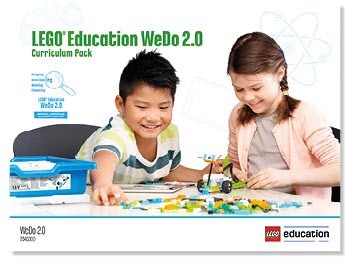 The WeDo 2.0 Curriculum Pack gives you more than 40 hours of teaching material over 17 projects that capture motivation and engagement across key science topics, including: physical sciences, life sciences, earth and space sciences and STEM subjects. You’ll also get access to the Design Library, which gives students ideas and inspiration for new models that they can build on their own time. * One Getting Started project divided in 4 parts, to teach the basic functions of the WeDo 2.0 platform. * Eight Guided Projects linked to curriculum standards, that provide teachers with a step-by-step instructional experience for completing each project. * Eight Open Projects linked to the curriculum standards, that provide teachers with a more free-flowing, open-ended experience. Each project offers around three hours of engagement and is delivered in three phases: explore, create, and share. The explore phase connects students to the real-world problem they will be asked to solve. In the create phase, students build, program and modify their designs. Lastly, in the share phase students document and present their findings to their peers. Every project in the pack also contains suggestions for extended learning opportunities entitled “Create More” and “Investigate More”. These extensions provide students with additional challenges to delve deeper into the research, design, building, and programming phases of their project. The Design Library offers students design and programming support, and contains inspiration models for them to build and modify if they have extra time. This gives students a place to hone their skills; learning new building and programming techniques without direct oversight from the teacher. Additional resources, such as: learning grids that align activities to key standards and objectives, integrated assessment tools, ideas for differentiation, and classroom management tips and tricks are also included.